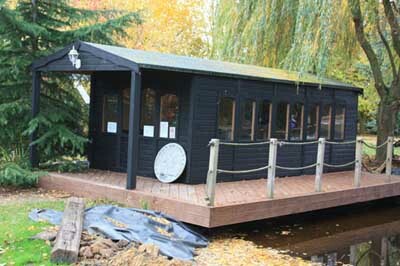 Based just outside Colchester in the rural Essex countryside, the Hutchinsons Woodyard has grown from modest beginnings. In its early years the workshop was dedicated to preparing individual garden features exclusively for our in-house landscaping projects. The quality and willingness to tackle any bespoke design soon attracted the attention of other garden designers and landscapers who began to approach us to help them with structures and buildings in their own garden projects. The Hutchinsons team have continued to developed their building designs and now offer a sample range of designs suitable for most garden settings. Images of these buildings are presented on this web site, with display buildings available to view at a few select garden centres throughout the region. 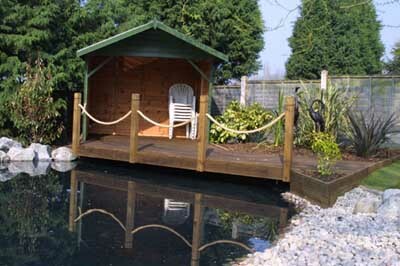 However, it is the production of high quality, bespoke garden rooms that the Hutchinsons team is most highly regarded. From initial site survey, through individual 3D CAD design to the erection and commissioning of the final garden room, our clients are consulted and advised to ensure a building that both parties can be truly proud of for many years to come. When combined with the award winning skills of the landscaping teams, Hutchinsons can simply modify any buildings surroundings to fully enhance the garden setting, both aesthetically and practically. This year, the Hutchinsons Garden Building team moved into a brand new four acre site in rural Essex, which it shares with the Landscaping teams. With far more storage and display area than ever before, this centre for horticulture will be able to offer visitors an even greater ability to visualise what we can offer and therefore develop their ideas with greater confidence. In 2013, a large, modern workshop designed built by our own craftsmen was completed. The 1,600 cubic meter workshop has allowed us to expand our building design ambitions, for we will be able to fully erect any of our designs inside the workshop to check and improve their finish without having to be concerned about the unpredictable British weather outside.